The Brand CILLA is Designed for Confident, Modern Women and the Minimalism. Occasions: Travel, Casual, Party, Shopping, Daily Use, Gifts etc. 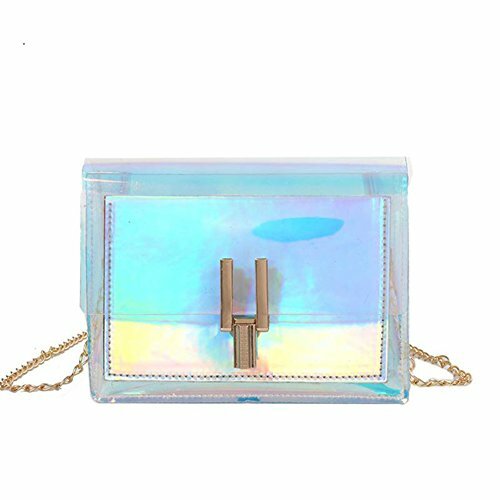 Features:Popular simple design,Hologram effect,Transparent box bag,Removable metal chain,Large capacity to hold your iPhone,accessories,keys etc. Please allow slight color difference due to different monitor display settings. If you are not satisfied with the items, return them for a full refund! NO QUESTION ASKED! Fashion & Stylish Design,Holographic shoulder bag with golden metal chain,can be used as single shoulder bag,crossbody purse,messenger bag,sling purse etc.The bag features the mirror effect hologram shinning design, which will catch eyes when you hold it. It is exquisite and easy to carry with you, with enough storage for your iPhone, lipstick, keys, cash and credit cards, small wallets and other accessories items. Perfect size when you don't want to carry a big heavy purse around. Small zise, big capacity.Chain shoulder strap,open the closure through the button. EXCELLENT PACKAGE & SERVICE: We provide excellent customer service. If you have any problem of our products, just contact us, we will try our best to help you with 200% patience and make you satisfied! If you have any questions about this product by CILLA, contact us by completing and submitting the form below. If you are looking for a specif part number, please include it with your message.